Looking for a topic to highlight a tiny bit of Geneva history is incredibly difficult, especially when everything is so fascinating. Narrowing down a topic and then narrowing it down further to be able to fit the information into a small display case at the Geneva Public Library is even harder. I stumbled upon my topic for the spring display quite by accident…which tends to happen more often than not since I spend so much time filing items into all corners of the archives. At one time, the city’s commercial district was home to 14 hotels with most of them on Exchange & Seneca Streets. The Geneva Hotel was located on the corner of Washington & Park Place, the only one of Geneva’s historical hotels still standing. It was built by Charles Williamson in 1796 and functioned as a hotel until 1854. The hotel was likened to the Astor House (a luxury hotel in NYC), and had “no competitor west of Utica” (Geneva-Advertiser, February 15, 1912). It was purchased by Dr. A.B. Smith in 1854 who opened it as the Geneva Water Cure and Hygienic Institute and operated as such for half a century. The institute was remodeled in 1993 and is now called Pulteney Apartments. The building would be remodeled in 1913 and renamed Hotel Seneca, functioning as a hotel for another 85 years until it started deteriorating in the 1960s, sold to a developer and torn down in 1982. Located on Exchange St near Seneca St, the Seneca Apartments now resides in its place. 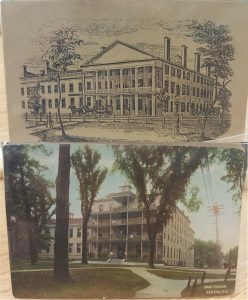 The Historical Society possesses quite a few pieces of Hotel Seneca that have been left behind including menus, wine lists, pamphlets, a napkin, and even a piece of wallpaper. It was difficult to determine if the Hotel Seneca was the same as the Seneca Hotel, because news articles would often call the former by the latter. 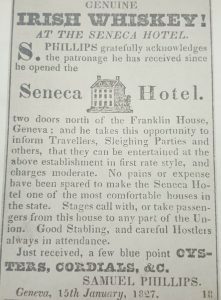 Finally, I stumbled across an advertisement for the Seneca Hotel in our files, which would point to it being a different hotel, then when doing a little digging in the city directories, it was clear the Seneca Hotel was definitely different. The hotel was demolished in 1965 and the Geneva Federal Savings & Loan Association building was built in its place. 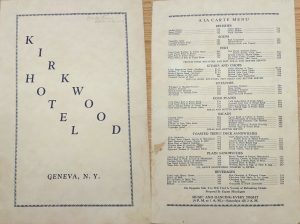 There were so many other hotels in Geneva including the Carrollton Hotel, Algonquin Hotel, Ball Tavern, Barryman’s White Cabins, Belhurst Castle, Brevoort Hotel, Burton’s Hotel, Geneva House, Geneva-On-the-Lake, International Hotel, Kashong Motel, Long Point Hotel, Mansion House, Tompkins House, & Torrey Park Hotel, and so many others that it would be impossible to fit it all in this blog (or in that small display case at the Library). 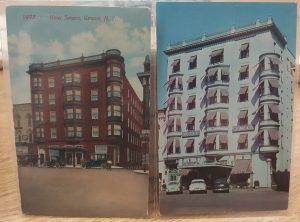 Our postcard collection (which can be found digitally on New York Heritage) includes a great number of these buildings, so I encourage you to take a look at those too! Excellent article. It brought back some names that I had forgotten about. Thank you very much.